My husband and I drove the 5 mile bridge over the Straits of Mackinac at least 8 times a year for 5 years. ﻿The mainland town of St. Ignace was the pit stop we would make on our 10 hour journey to and from college. This area of the country is very scenic. This pic is over 12 years old. This is the Lake Michigan side. Lola in the back, MJJR next to dad. This is the view from my old apartment. That is a ski hill. This is an old Copper Mining Building. Also view from my apartment. The sentimental inspiration for this quilt along with the beauty of Bonnie's Quilt inspired me to say yes this year. Please leave a comment if you have participated in the past. Why did you participate? Your experiences? Deadlines? Keeping Up? Did you alter the pattern? Commitment is scary! The original colors are bright green, the lighter turquoises, the brighter pinks and the lighter yellows. My stash is lacking in some of these colors. The color scheme may be altered....scary. My motto is use what you have....buy only what you truly need. Our Christmas Traditions is quickly approaching. Our group of church ladies have met a few times and put together this quilt. We took the leftovers from a project for the local library and put the center "square in a square" portion together. This project pulls stash fabric from many quilters and helps keep the price down. We did purchase the outer border fabric. The quilt was machine quilted on a Juki TL-98. The event has handmade candies, pies, cookies, homegrown canned jellies and salsas. This year I get to oversee the silent auction room. Stop over to Freemotion by the River and see all the designs. We exchanged 5" black/dark grey squares back in July. Often I need a little time to make some decisions. This time the inspiration came from a quick quilt another guild member made and an idea that keeps popping into the creative ways. My original plan was to end at the black border. The quilt would measure about 50" x 50". It would be an appropriate size for a donation quilt to Margaret's Hope Chest. I have donated to this group before. 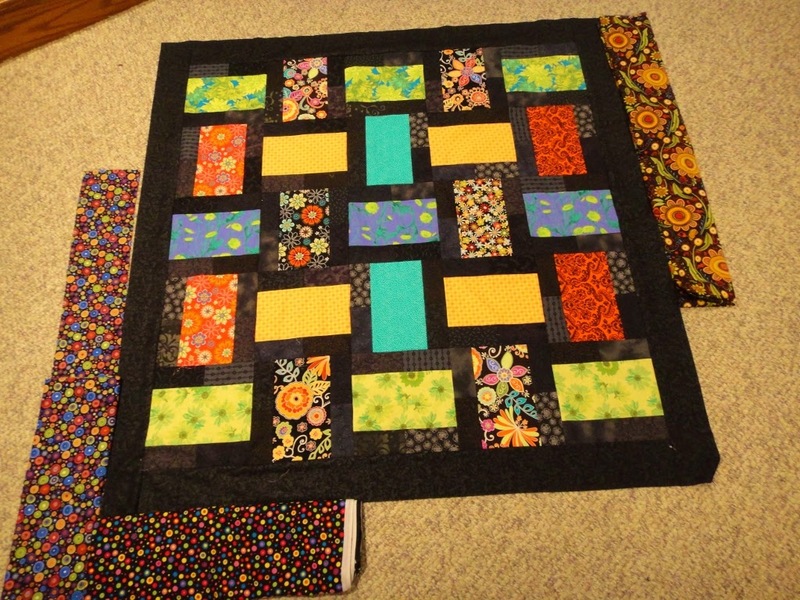 There are other quilts in the pipeline and I would like to make the donation to Margaret's Hope Chest in February. Sooo there is time. NOW......this quilt could be sent along with another quilt to 2 beautiful great nieces for Christmas. If a border print is added the quilts will be the same size. 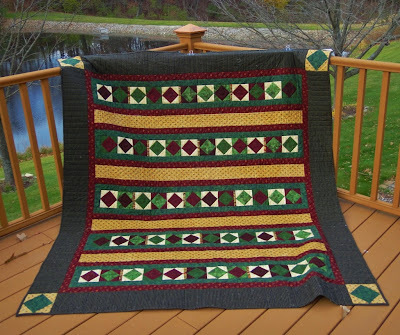 Check out the other quilt, a torquoise beauty here. Which fabric do you like? I am leaning toward the dots on the left side...which are different from the bottom. Or shall I call it good and save it for February? Both nieces are not yet school age....and DH did some early Christmas shopping so the Long Arm (yes, he wore me down and I finally agreed) arrives tomorrow. !!! EEK! That means it shouldn't be too bad to get another top together. The 5" exchange this month was pastel. These would make a great uplifting quilt for Margaret's Hope Chest. 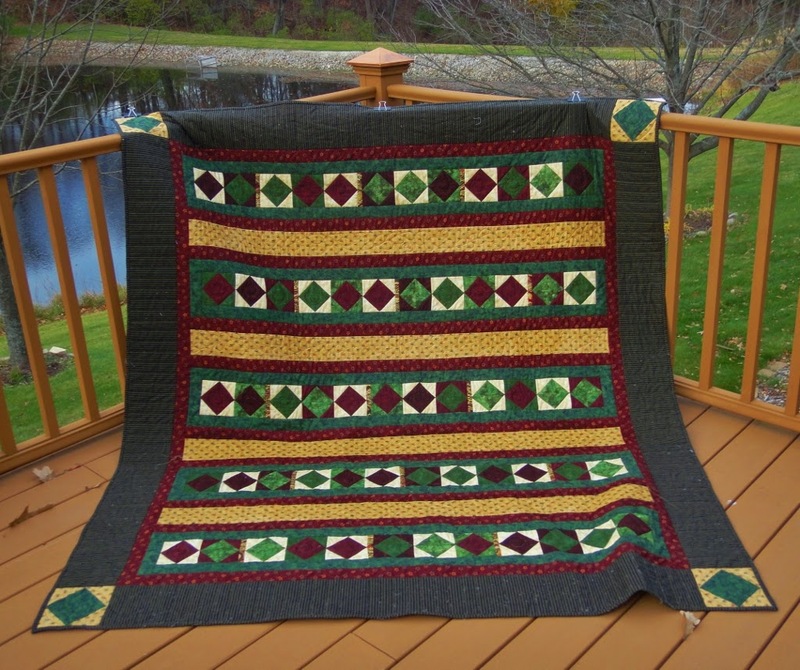 Linking up to Judy L.'s Patchwork Times. Check out more Design Walls.